In the modern world, where people have a large appetite for apps and are desperate to get the latest gadget, many golf companies are trying to use technology to help improve your game. SkyCaddie's SkyPro is one of those devices. Designed to "See, Groove and Improve" your swing, it is small in size but huge in terms of value and potential. We were really impressed and here's why. 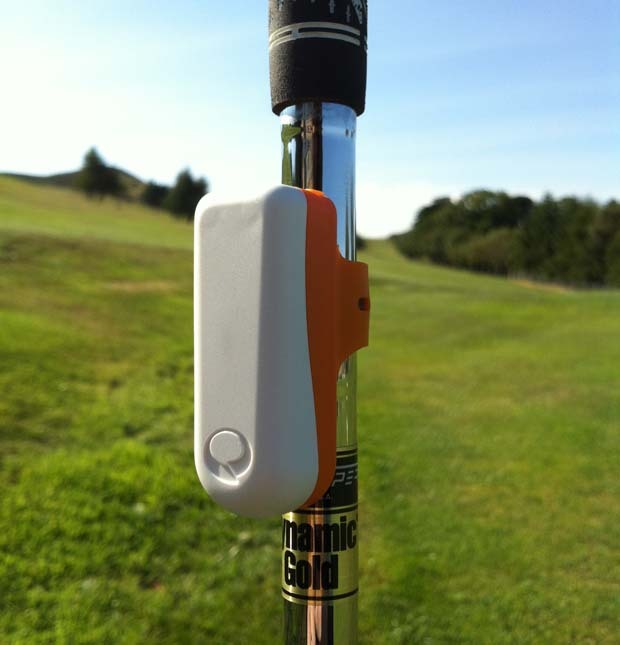 Simply put the SkyPro is a small tranmsitter device that attaches to any club your bag and gathers thousands of data points about your swing. It then connects via Bluetooth to any iOS device (iPhone, iPod Touch or iPad) and uses the SkyPro app to view and analyse your swing. The device itself looks like a small USB thumb-drive, weighing less than 28 grams (1oz) and just over 5cm (2 inches) long and features a small screw clip attaches easily and securely to the shaft of your club. 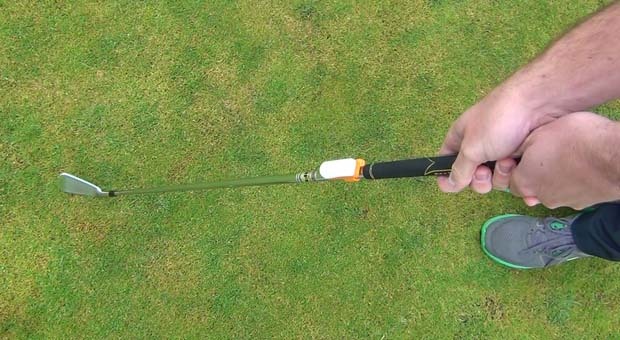 Attaching the device to your club could not be easier. 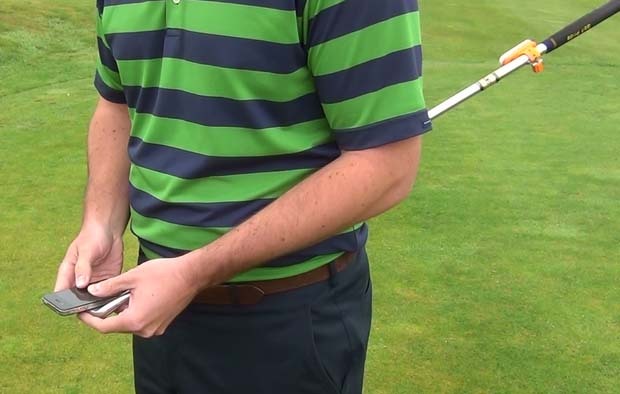 Simply point the device down towards the clubhead and screw the SkyPro just below the grip. The sleeve on the device is padded to ensure you don't scratch or damage your expensive steel or graphite shaft. Inside the SkyPro box you will also you'll find the device, charging pod/case, USB charging cable and concise instructions. The instructions are brief because the device is easy to use and most of the instructions comes via the free app that you download from the Apple App Store. The Skypro takes just one hour to charge from 0-80% (two hours to 100%) and once charged it offers you 8 hours of practice time thanks to SkyPro’s "intelligent power management technology". It is able to sense when it is being used and in active us it will last over 30 hours and over 100 hours if it is just on a club that isn't being used. Once you have the SkyCaddie SkyPro out of the box and charged, you need to download the app on your iOS smartphone or device. Either search "SkyPro" in the App Store or scan the QR code on the box. The app is free and only 41MB. Once downloaded, it's time to head to the range. You don't need to worry about lining up the device specifically in the middle of your shaft. Calibrating the SkyPro will take care of that and ensures the device knows exactly where your shaft and clubhead are throughout your swing. To calibrate the device, you need to start up the app and make sure that Bluetooth is enabled on your iPhone (iPod or iPad). The quick and simple process takes about 30 seconds and requires you enter which type of club you are using - wood, iron or putter - and then perform a couple of movements that will have fellow golfers thinking you are taking up golf meditation. In short, you place your device flat on your clubface, make sure it is centered and then rotate the club around your body allowing the SkyPro to gather everything it needs to begin collecting data. Once calibrated, it's time for your SkyPro to gather data. 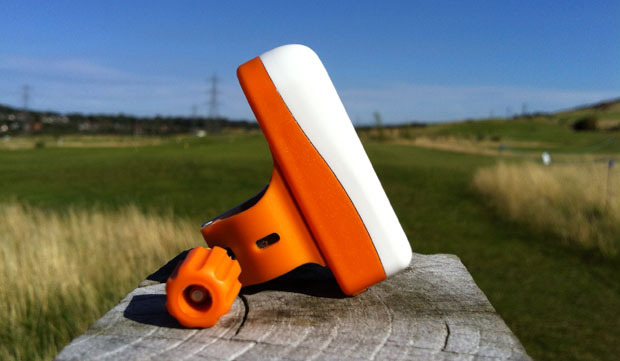 The device detects an impact, and its internal motion sensors begin to collect and display your swing data immediately. If you have 1GB of free space on your iPhone or iPad, you can store 250,000 swings. That's enough for 100 swings a day for seven years! The basic screen shows the swing speed of each swing you take along with your swing path from one of three angles: Down the Line, Top View or Front View. In each view you can watch your swing back in real-time, half-speed, quarter-speed or control the speed yourself and pause when you want. As you can see in the images above, each swing is split into 5 notches or segments. Scroll to one of these notches/circles and the app will display specific data for that part of your swing, such as shaft angle at address/impact, face angle half way back, backswing length, shaft lean at address/impact and many more. Following each swing, a tab will appear at the top of the screen named "Alerts". 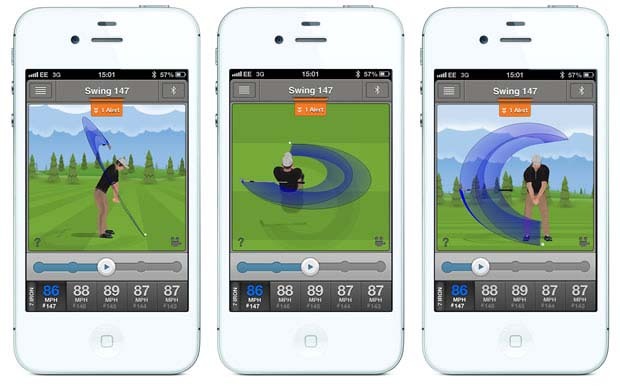 Tap the tab and it displays 11 pieces of data gathered throughout your swing, the same angles/measurements displayed via the notches on the basic screen. 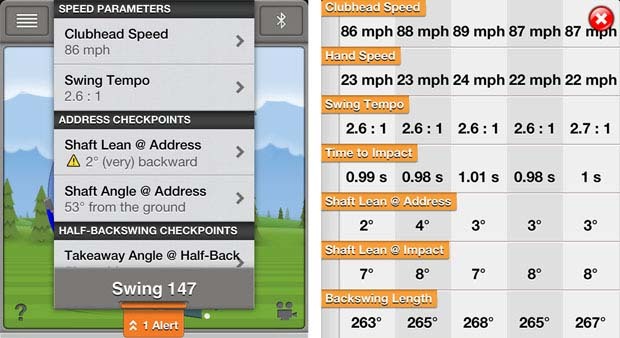 What is great about the "Alerts" tab (below left) is that it highlights weaknesses in your swing. If you overswing, and allow your club to go past parallel at the top of your backswing, an alert will be highlighted. Scroll to the bottom of the alerts and you can produce your very own data table (below right) comparing all your swings based on the same specific parameters. Even at this point, you are still just scratching the surface of what the SkyPro can do. The device does not only highlight your weaknesses, it helps you fix them. That is where the "Groove" functionality comes in. In the Groove area of the app, you can select one of these parameters and work on it specifically and independently. Using either a specific swing as a reference or a custom range, you set your goal for the exercise. For the example of overswinging, you may set a range of 10-degrees short of parallel to parallel, giving you a 10-degree target for each swing. Once you've set your target, simply swing and the app will let you know if you were within the designated area. It sounds complicated, but SkyPro makes it very simple. Each swing is met with an approving noise and a green tick, or an error noise and a fail. The "Improve" part of the SkyPro tagline is the key for anyone using the device. How can using this piece of technology help me improve? Seeing the data provided by the SkyPro and using that to feel where the club should be throughout your swing offers the feedback needed to attack weaknesses in your swing. It may not be able to converse with you like a teaching pro, or offer drills and exercises suited to improving your flaws, but it does offer an analytical set of eyes. In April 2014, SkyPro updated the app to enable it for putting training. It works in exactly the same way as a full shot and measures all aspects of your stroke such as club head speed, swing path, face angle, swing plane, shaft lean, tempo, rise angle and more. I found the shaft lean and loft at impact to be very useful as they are related and you can see how much loft you are adding to the clubface with your stroke and hand positions. The swing path and face angle also come into their own more with the putter too, so this is really an excellent tool that you can use inside and outside to improve your stroke. There is even data from PGA Tour coach Micheal Breed's own putts if you wish to see how you stack up to a professional and this sort of benchmarking would be something I would lke to see more of on the SkyPro. What we liked about the SkyCaddie SkyPro is the different layers it offers. Whether you are a beginner looking for simple information on your swing or a professional looking deeper into the angles and motion of your swing, SkyPro can provide you with the information you need. If you just want to know your swing speed and get a general look at the path of your club, you can do that very easily. If you want to dive deeper, the SkyPro is more than happy to provide tonnes of information. This immediate feedback and repetitive training is extremely effective. It allows you to swing freely, but learn where you swing should be. It is like having a teaching pro there alongside you. That is what makes the SkyPro so effective. It is accurate, easy to use, effective and can be used anywhere. However, be warned if you choose to use it in the office or your home, the device does need to feel an impact to register a swing. You don't necessarily have to strike a ball, simply brushing or striking the floor will work. Therefore, stay away from the new carpet or rug. Whilst the app does display the option to select and analyse your putting stroke, that functionality is not available with the first generation of software. We expect it won't be long before that is added, and should make a nice addition, but for now the data is reserved to irons and woods. Having used apps and devices like this before, we were disappointed that the device couldn't produce face, sole or attack angles. Understanding the position and angle of your clubface at impact can be very helpful. SkyCaddie tell us they are working on more face angle data and that those changes will be available, via an app update, very soon. Lastly, the app and device are great for those of us in possession of an Apple iOS device. However, currently, there is no app for Blackberry, Samsung and Android. So if you are using one of those devices you're on your own for now! At around £160, the SkyPro device costs the same as two or three lessons with a teaching pro, but hopefully you will recoup that in less lessons as you are more likely to ingrain what you have been taught and improve quicker. Our recommendation is to go for a lesson with it attached to record the positions you should be in and then you have a record of what you should be working on to then use the Groove function to perfect. It seems that the golf world is finally producing gadgetry worthy of the average golfer. The SkyPro is a really fun, intuitive, comprehensive piece of kit. It is certainly aimed towards to the keen, avid, aspiring golfer and the user interface of the software is what sets this apart from other devices on the market. Whilst all will enjoy seeing their swing speeds or path, we feel to get the most out of it, you need to combine this with instruction from your golf coach so you are working on the right things. For the price of a new club, you can open your eyes to a whole new world of swing analysis. It's well designed, well priced and most of all, well liked by us. My SkyPro works perfectly with my Samsung S7 Android phone and the battery life is fine. I am totally happy with the product and it's doing wonders to improve my swing. Highly recommend this product. It doesn't work with an Android device - this should be clear in the marketing material. I will not buy anything else for SkyGolf! My Linx watch battery will not carry me through an entire round of golf (about 12 holes), and the only solution Skygolf has is buy a new Linx Watch! I should be able to replace my battery but SkyGolf doesn't want to offer this option. They have also, in the past, repeatedly promised us technologies that never materialised. I don't feel that I can trust them anymore to look out for my interest as a consumer. I am not renewing my prescription with them. Get SkyCaddie maps on your phone with Mobile GPS App. Galvin Greens app checks weather & tells you what to wear. iPing app updated to include Workout for Watch wearers. Easy to use free phone app has the number of your golf game.